The stylish new Sony Cyber-shot N2 offers the highest ever resolution and sensitivity from a compact Cyber-shot camera. Complementing its Carl Zeiss Vario-Tessar 3x Optical Zoom lens, the 10.1 effective Megapixel Super HAD CCD ensures superb, sparkling pictures with unrivalled clarity and detail. With an improved sensitivity of ISO 1600 and special high sensitivity mode, the Cyber-shot N2 captures beautiful, blur-free images – even in low-light situations where other compact cameras struggle. High resolution images can be viewed on the large 3.0-inch Clear Photo LCD Plus screen that features handy Touch-Screen access to shooting and playback functions. The Cyber-shot N2 also packs a wide range of other functions into its slim (22.7mm) brushed gold-tinted aluminium body, including Pocket Album and Slideshow with Music to get even more out of shooting and sharing your photos. Breaking the 10 Megapixel barrier for the first time in a compact Cyber-shot camera, the Cyber-shot N2 uses a Sony-developed Super HAD CCD sensor with an extremely high resolution of 10.3 Megapixels (gross), equating to 10.1 effective Megapixel resolution. 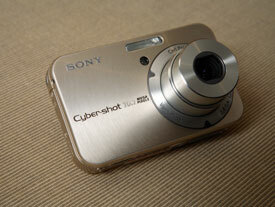 The 1/1.7 inch size sensor is larger than the CCD found in the Cyber-shot N2’s predecessor, the Cyber-shot N1. This boosts dynamic range, reducing the causes of “washed out” overexposed images – a common problem with cameras that pack a high pixel count into a small sensor size by reducing pixel pitch. The high-quality Carl Zeiss Vario-Tessar lens features a 3x Optical Zoom range. 6x Precision Digital Zoom and 17x VGA Smart Zoom modes provide even greater magnification of distant objects. The Cyber-shot N2 boosts sensitivity to ISO 1600 – even higher than the ISO 800 of its predecessor. In addition, a new High Sensitivity Mode selects optimum ISO settings while reducing colour noise and luminance noise for clear, natural images – even when shooting without flash indoors or at dusk. The hybrid 3.0-inch touch-sensitive screen features Clear Photo LCD Plus technology for clear, vivid image reproduction. The screen’s smooth anti-reflection layer improves image quality while suppressing reflections for increased contrast, especially outside in bright sunlight. Simplicity and ease of operation is a keynote of the Cyber-shot N2’s design. A wide range of shooting and playback functions can be accessed directly via the touch-screen. The paint function allows artistic additions to photos using the touch-screen and supplied Paint Pen stylus. The Cyber-shot N2 offers 25MB of internal memory, plus an additional separate memory capable of storing up to 500 images that are automatically saved as thumbnail-sized VGA copies and organised for quick browsing and sharing in Pocket Album mode on the 3.0-inch screen. Thumbnails remain saved in the camera even when original images are transferred to a PC or Memory Stick media is removed. Images can be viewed on the camera’s LCD screen as a slideshow. Slideshows can be customised further with the additional effects (simple, nostalgic, stylish, active) and optional music accompaniment (4 preset tunes). Bundled Music Transfer software allows this preset music to be replaced with favourite songs stored on your PC. It’s easy to transfer and manage photos with any PC using the supplied Picture Motion Browser software. The easy-to-use package automatically organises images uploaded from the Cyber-shot N2 that can be browsed in calendar format. In conjunction with Sony GPS-CS1, images can also be displayed in Picture Motion Browser’s “map view” mode, indicating where as well as when they were taken. Weighing just 151g*, the Cyber-shot N2 is the perfect go-anywhere accompaniment for going out, holidays, family occasions and more. Eight pre-set Scene Selection modes adjust optimum shutter speed and exposure values for spontaneous, worry-free shooting. In addition, five colour modes are available to suit any shooting conditions. Manual exposure allows greater creative control over camera settings for more ambitious photographers. The supplied Lithium Ion battery features improved Sony STAMINA technology, to deliver up to 300** shots on a single charge. This equates to around 2.5 hours continuous shooting time.